Brooklyn Prospect is embarking on an ambitious experiment to eliminate segregation from education. What Happens When You Design a School to Be Diverse? Brooklyn Prospect is embarking on an ambitious experiment in school integration. Twins Khadejah and Yazmine Taylor, both 14, take “embedded honors” in ninth-grade algebra and English at Brooklyn Prospect Charter School. BROOKLYN—The kind of high school Juana Lino and Ezra Taylor wanted for their twin daughters is all too rare, even in New York City: one with rigorous academics and a racially and socio-economically diverse student body. So Lino was pleased to discover Brooklyn Prospect Charter School while searching for schools online. The “diverse by design” charter opened seven years ago and now includes a middle and high school for grades six through 12 and an expanding elementary school that currently goes up to the second grade. Brooklyn Prospect is part of a growing national movement aimed at creating a new paradigm: racially and socio-economically integrated charter schools. Across all grades, Brooklyn Prospect enrolls 36 percent white students, 34 percent Hispanic, 14 percent black, 8 percent multiracial, and 6 percent Asian/Pacific Islander. Forty-five percent of the children qualify for free and reduced lunch, a marker of economic hardship. Around 17 percent have special needs. That may not precisely reflect the demographics of the city’s schools as a whole—where 14 percent of students are white, 27 percent are black, and 40 percent Hispanic—but it comes closer than most city schools and certainly most charter schools. A 2014 report from the Civil Rights Project at UCLA concluded that nearly 3 in 4 New York City charter schools are “apartheid schools,” meaning they enroll less than 1 percent white students. Brooklyn Prospect was one of the notable exceptions. Indeed, scores of “no excuses” charter schools have opened across the country in recent years with the explicit goal of serving mostly low-income black and Hispanic students (although “no excuses” schools are by no means the only segregated charter schools—or schools of any type, for that matter). Brooklyn Prospect is trying to create an alternative model to show that the charter movement can also be home to some of the country’s most diverse schools. The National Coalition of Diverse Charter Schools has doubled in size since it was set up two years ago; Brooklyn Prospect was a founding member. Most of its member schools are located in cities experiencing rapid gentrification and an influx of young, white families in certain areas, including Brooklyn, New Orleans, and Washington. Most of Brooklyn Prospect’s students come from the city’s District 15, a diverse area that encompasses part of Brooklyn’s western side. Charter schools are legally prohibited from selecting kids based on race. But Brooklyn Prospect is able to set aside a designated percentage of seats—the specific number changes every year—for students from low-income backgrounds, which helps ensure a mixture of race and ethnicities. Diversity does not guarantee equity, of course. And several of the new diverse-by-design schools struggle to avoid replicating the segregation—both academically and socially—that plagues the American education system as a whole. On average, white students outperform students of color at Brooklyn Prospect. Black boys are disciplined at greater rates than any other group. And although some students’ friendships transgress race and ethnicity, noticeable levels of self-segregation persist among the kids. The school’s co-founder and executive director, Daniel Kikuji Rubenstein, who is Japanese and white, knows the school has a lot of work to do. “Integrated schools benefit all students, especially low-income students,” he says. “But there’s no one who does this work that thinks like, ‘Hey, you know, if this student who grew up in poverty sits next to this middle-class kid, he’s going to get smarter.” Rubenstein says creating a diverse student body was only the first challenge. Now, the school needs to focus more on equity. 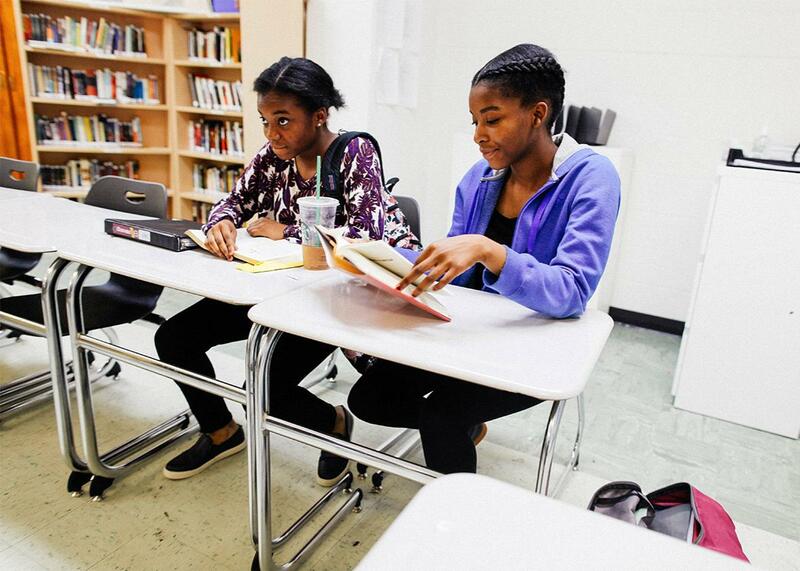 To help with that goal, Brooklyn Prospect has turned to a relatively new strategy called “embedded honors” in its ninth- and 10th-grade classrooms—a strategy leaders such as Rubenstein hope will help combat academic and social segregation. The program keeps all students in the same class rather than creating separate honors-level courses for more advanced or ambitious students. Admission to the embedded honors track within the class is based solely on student choice rather than grades, test scores, or teacher recommendations. The hope is that the embedded approach will foster equity in a few different ways: First, by allowing any student to opt in to honors, there’s no teacher bias in determining who belongs on an accelerated track and who doesn’t. That’s important, since when teachers pick who takes honors or students have to test in, the classes skew white and middle-class. Second, it means students of all backgrounds, ambitions, and skill levels remain together throughout the school day; when there’s academic segregation, the school’s thinking goes, that can lead to other forms of segregation as well. In the long run, school officials hope the new approach to honors will help close the racial achievement gap at the school and take a step toward promoting school desegregation—and not just on paper. The Taylor twins with their mother, Juana Lino. Lino and Taylor had several reasons for seeking a diverse school for their daughters. They have happy memories of their own experiences at elementary and middle school in Brooklyn’s Gowanus neighborhood, where they met. The school enrolled a mixture of Italian, Middle Eastern, Hispanic, and black children, Lino says. She didn’t want her daughters in classes where the students had never “seen a white child in the school.” And she thinks that ultimately a racially homogenous school is no preparation for life, because the real world is diverse. She considered it a plus that Brooklyn Prospect is a charter school, since she believes it is more innovative and adaptable and more likely to set high goals for students. But Lino, like school officials, knew that racial and ethnic diversity on its own would not be enough to guarantee her daughters’ success. There will always be people who will have low expectations for her daughters because they are black and Hispanic, she says. For this reason, Khadejah and Yazmine seized the opportunity to take embedded honors. This semester they opted for the more challenging coursework in both algebra and English (freshmen can take a maximum of two embedded honors classes at a time). Brooklyn Prospect English teacher Tyra Frederick chats with the Taylor twins. Frederick piloted the embedded honors in her ninth-grade English class. 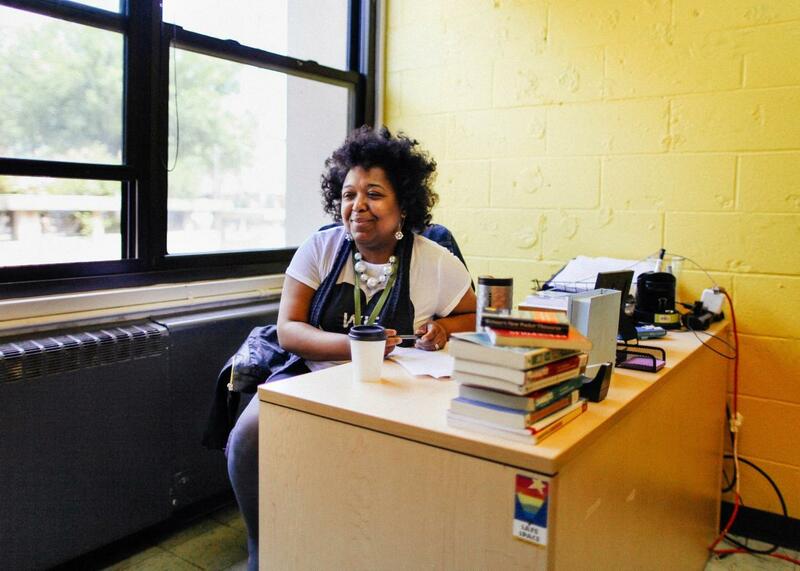 To succeed at its mission, Brooklyn Prospect has to change both minds and test scores. The racial gaps in academic performance that have existed in American schools for generations are very much present at the school. Hispanic students at Brooklyn Prospect lag significantly behind their white and Asian peers, according to New York State Department of Education data from 2015. In English, for instance, more than half of white and Asian middle-schoolers scored proficient on state-run tests, compared with less than 30 percent of Latino students. The data for black students is suppressed for privacy reasons because too few black students took the test that year. On the same tests for the previous year, just a quarter of the 35 black students tested were proficient. The school’s internal analysis has also found persistent racial gaps, although administrators declined to release specific numbers. They looked at three years of middle school results from the current seventh-, eighth-, and ninth-graders. In both math and English, Hispanic students’ scores have been trending upward. Black students’ scores went up in the first year but then worsened. “People understand that we’re not achieving our mission unless we are winning on the achievement gap,” says Rubenstein. He says there’s a particularly strong need for improvement when it comes to black male students, and he’s optimistic that programs such as embedded honors will help reduce the gap over time. The traditional approach to honors leads to academic “tracking” and segregation based on skill level, which has been shown to contribute to the achievement gap, Rubenstein says. This year, mandatory monthly professional development meetings for Brooklyn Prospect staff have focused on how teachers can help reduce the achievement gap. But some teachers say that when discussions turn to race, some colleagues can grow hesitant or uncomfortable. “I feel like it is hard to talk about … maybe people are not ready to adjust their own biases,” says Kadina Morgan, a science teacher who is black. Lino, who was president of the Parent Teacher Student Organization for a year and continues to be heavily involved at the school, says there’s also a racial divide among the parents. At meetings, they tend to cluster with others from the same racial groups, and parents of color are sorely underrepresented overall. Lino believes that work and family commitments prevent many people of color from joining. “You can count them on one hand,” she says. 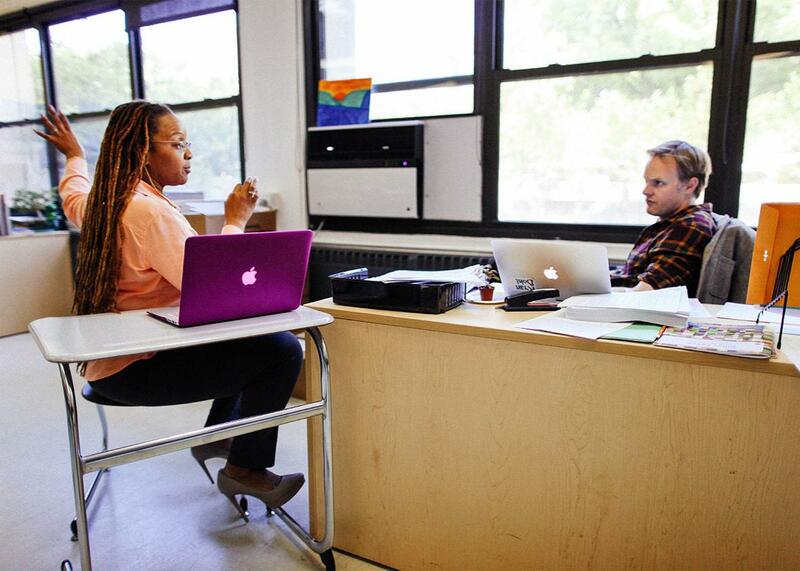 Brooklyn Prospect teachers Gail Turner and Ryan Bohl talk after class. Bohl runs embedded honors in his 10th-grade English class. Brooklyn Prospect’s version of embedded honors is somewhat more flexible than High Tech High’s. It’s easier for students to drop out of honors at Brooklyn Prospect, for instance, though teachers say that happens rarely. At Brooklyn Prospect embedded honors students attend separate seminar classes outside regular school hours twice a month. High Tech High, on the other hand, carefully avoids even the slightest separation of its students. “We are hell-bent on not segregating kids,” says Rosenstock. It’s too early to say if the embedded honors program will successfully narrow the achievement gap at Brooklyn Prospect. But staff agree that in its second year, the program has successfully attracted a diverse group of students to advanced coursework. Half the ninth- and 10th-graders who take the program are students of color, says Tyra Frederick, a black English teacher who is overseeing the rollout of the program and taught the first embedded honors class last year. This is an achievement on its own. There’s a pronounced shortage of black and Latino children in gifted and talented programs in New York and across the country. The city’s selective public high schools are notoriously lacking in diversity: Out of 860 students admitted to the prestigious Stuyvesant High School for next school year, only 23 are black or Latino. This is the dichotomy that Nikole Hannah-Jones confronts in a New York Times Magazine piece this week, describing what happened after her decision to send her daughter to an effectively segregated, high-poverty neighborhood school rather than a selective public school with far fewer minority students. Frederick believes the traditional approach to honors—basing it on some combination of test scores, grades, and teacher recommendations—breeds exclusivity and gives educators ultimate power over who is a “smart kid” and who is not. “We know the people on the losing end of that deal are minorities,” she says. Frederick remembers, very clearly, the isolation she felt as one of few black children participating in gifted programs as a child. But challenges remain. Participation in ninth-grade algebra embedded honors, for example, is more racially skewed than the English program. “If you look around it’s mostly Caucasian, mostly girls, who choose to do it,” says Natalia Botia-Lam, a ninth-grade algebra teacher who is Hispanic. The twins noticed, too. 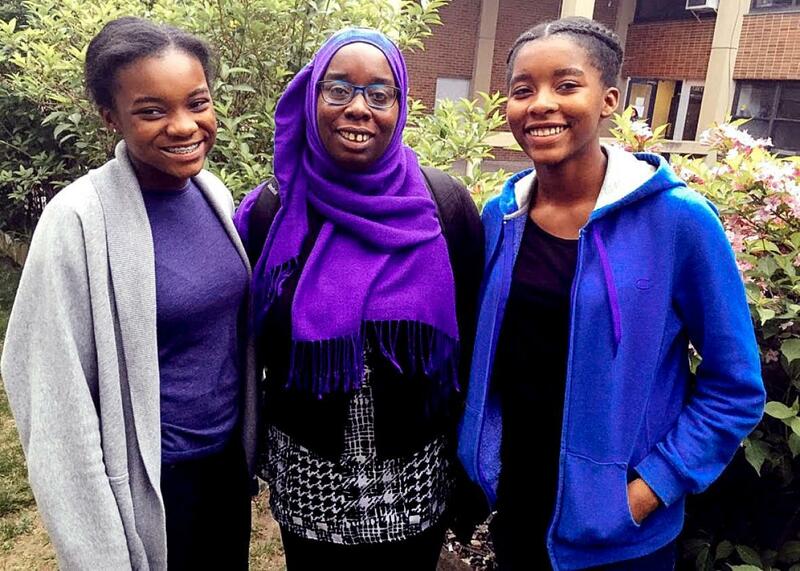 They are the only black students taking embedded honors in ninth-grade algebra. Both think the class is less diverse because the extra English seminars are in the morning while the algebra ones are in the afternoon. After school, they say, many kids are lured away by sports. The black boys, in particular, want to play basketball. The school will likely always struggle to get more low-income students or those with severe academic challenges to opt in to embedded honors given the time commitment. Along with the extra seminars, students must complete extra assignments and take harder tests. When they studied plays in English, for example, Yazmine and Khadejah had to write and perform their own short play, in addition to the regular assignments. Each 10th-grader in embedded honors English is required to design an entire lesson plan and teach the class for the day. The school believes there are benefits to everyone, not just children of color. Principal of Brooklyn Prospect’s high school, Ingrid Wong, says if students are making their own choices about advanced classes, rather than being placed in them by teachers, they become more motivated and clear about their own strengths and interests. “Students are exposed to each other, can push each other, and are able to learn from each other’s cultural experiences,” she says. Tyra Frederick at her desk at Brooklyn Prospect. In addition to embedded honors, Brooklyn Prospect is trying out various other initiatives to make the school more inclusive and equitable. After an internal analysis revealed that black boys were disciplined at higher rates (the school would not release specific numbers to protect student privacy), the leaders started a training program aimed at helping teachers build stronger relationships with middle-schoolers who got in trouble most. By the end of the school year, the statistics had improved, according to LaNolia Omowanile, the school’s director of academics who is black. Brooklyn Prospect also runs a girls’ empowerment group and an organization called “guy code” for boys to talk about their role as men. Both aim to attract students from various racial and ethnic backgrounds. The school says many of their sports teams and clubs, like model United Nations, are integrated and reflect the racial makeup of the school. On a recent “diversity day,” the school held workshops for the students that encouraged discussions about race, biases, and stereotypes. But there are limits in terms of what the school can do about social segregation. After all, it can’t pick kids’ friends for them. While the school might be diverse, the communities where the kids live often are not; students frequently stick with friendship groups formed in more homogenous elementary and middle schools. No one has reported animosity among kids of different backgrounds or skin colors, but both teachers and students say social groups aren’t as racially integrated as they could be. Khadejah describes tables at the cafeteria that are mainly white or black. The Hispanics, she says, float between. (Although on one recent Wednesday she looked around and, seeing relatively integrated tables, said, “OK so, today’s not a great example.”) Khadejah and Yazmine usually eat lunch with a set of white female twins, a white boy, and a Hispanic girl. Black affinity grouping evokes many white people’s “racial anxieties,” says Tatum. They might have an internalized fear of black people, she explains, that’s triggered when they see groups of black children. In reality, teenagers are often just trying to figure out their identities as members of certain races and grapple with frightening events, like the shootings of unarmed black teenagers. “It’s often more comfortable to do that with people who are having a similar experience,” she says. Lena Gallagher, a junior from a mixed-race background, says some white teenagers (like many white adults) aren’t interested in talking about race. “When I’m trying to get people to come to Black Lives Matter protests, kids of color won’t go because their parents won’t let them or they’re busy. White kids are like, ‘Oh, I don’t know, I’m not into that.’ It’s not a priority for them to go to a protest,” she says. During lunchtime on a sunny spring day, Khadejah and Yazmine sat outside school with friends, eating doughnuts they’d bought at the deli across the road. There were just a few weeks left before summer break. Both felt happy to put ninth grade behind them. The first year of high school had been hard: Their friendship group had shrunk significantly after a falling out with some close friends from middle school. Sometimes they wondered if they should go to a new school for a fresh start. Her mother agrees. A school alone can’t solve the problem. But overall she thinks Brooklyn Prospect is on the right track. She likes that it tries to be inclusive and that school leaders are approachable. They are not, she says, shying away from conversations about race, however uncomfortable they may be. And although conversations on their own don’t lead to equality, they are a solid—and necessary—first step.